winter weather advisory is in effect for the entire area Wednesday afternoon through 6 am Thursday. The advisory begins at 12:00 pm Wed.
•	Light to occasionally moderate snow is forecast to develop Wednesday afternoon and gradually move across during the evening commute. The snow will transition to a wintry mix across NYC and Long Island around 7 to 8 pm. The wintry mix will lift north across the region through the rest of the night. A light glaze of ice is possible as the precipitation becomes a wintry mix after the evening commute. The precipitation will become plain rain for much of the region after midnight. Light freezing rain or drizzle may continue across the interior. o	Snow Accumulation: Total snow and sleet accumulation of 1 to 3 inches is expected across much of the area. 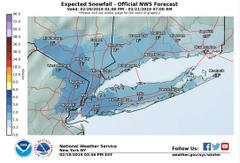 Amounts may be closer to an inch across eastern Long Island and southeast Connecticut. o	Snowfall Rates: Snowfall rates of up to one half inch per hour are possible during the evening commute. o	Ice Accumulation: A glaze of ice is possible with a few hundredths across the interior where freezing rain may occur for a longer duration overnight Wednesday. o	Travel will be hazardous during the Wednesday evening commute. Hazardous travel will continue Wednesday night, especially on secondary and untreated surfaces.